We are the go-to renewable energy company for advice on whole-house systems for architects, developers and self-builders. 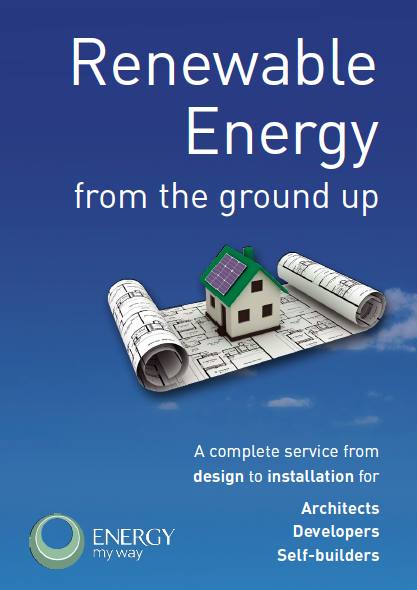 EnergyMyWay is a single source of impartial, educated advice on all renewable and energy efficient technologies for your new build or renovation project. Protect yourself from long-term energy uncertainty. We did so much research when we were planning our new home and we came across a lot of conflicting advice. It was more complicated than we first thought. It was a great relief to find EnergyMyWay. They were totally impartial, and they looked after everything right through to the installations. We couldn’t be happier. Information for you to take away. We’ve written a brief guide to Renewable Energy from Ground Up: A guide for architects, home renovators and self-builders. The subject of renewable energy raises a lot of questions that we hear every day. Our approach is to fully understand your individual project and give you total confidence in your decisions. Ask us. We’ll be delighted to answer.